The much-derided title notwithstanding, Selfie looks like quite the promising pilot, and here are a few reasons why. A TV show with a focus on social media is actually kind of a great idea. Already, lots of shows make heavy use of conventions like texts being displayed on screen, but that’s just the tip of the iceberg. Selfie looks like it’s going to cover everything from viral videos to being “Insta-famous,” and what a way to connect with that coveted 18 to 34 demographic, eh? 4. It’s time for an Asian American male romantic lead! 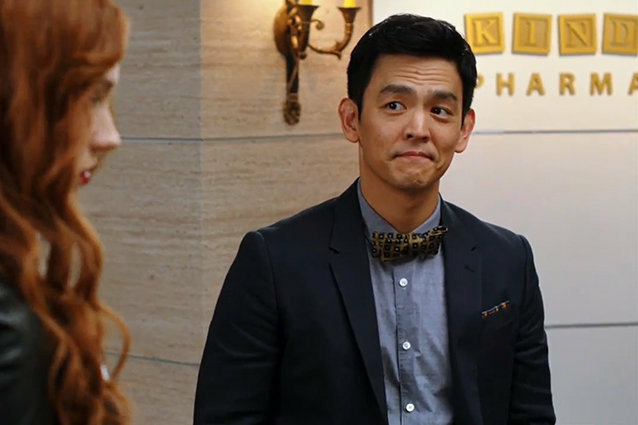 Asian American men are traditionally emasculated by pop culture (see: Long Duk Dong), so it’s great to see the hero of a romantic story portrayed by Korean American actor John Cho. Plus, we know from his excrutiatingly awkward (yet ultra-relatable) elevator rides with the girl of his dreams in Harold and Kumar that he’s going to absolutely kill at the romantic comedy genre. Dude has serious comic chops — have you seen Harold and Kumar Go to White Castle? Or his cameo on How I Met Your Mother? Or 30 Rock? The list goes on — basically, Cho as a modernized Henry Higgins is a stroke of genius. 2. And the other lead? Doctor Who alumnus Karen Gillan is certainly no stranger to excellent comic timing either. And we’re more than excited to see her particular brand of humor on American TV — we’ve missed her ever since the Weeping Angels spirited Amy Pond away to the 1930s! 1. Everyone loves Pygmalion/My Fair Lady! It’s the mother of all makeover stories, after all. Heck, the story has been told so many times we can barely keep track, yet we’ve thoroughly enjoyed each version. Here’s a refresher: the original Greek myth Pygmalion, to George Bernard Shaw’s play of the same name, to the musical My Fair Lady, to the ’80s prom movie, She’s All That. See? All delightful!